Okay, but what is the comfort zone really and why should we leave it? Let’s do a little digging to find out. The most scientific explanation of what a comfort zone is relates it to anxiety levels. Your comfort zone is any type of behavior that keeps you at a steadily low anxiety level. Imagine something you do all the time, like cooking dinner or commuting to work, or watching TV. Everyday activities that you’re used to won’t make you feel anxious and uneasy, so they’re part of your comfort zone. Although anxiety isn’t something we’re prone to go looking for, a little bit can be surprisingly beneficial. We often need just a hint of anxiety to push us to get our work done, or to improve our performance. A study of mice from 1908 showed that when a task was very easy, performance increased as anxiety levels rose. When a task was harder, however, increased anxiety only helped to a point—after a certain threshold the combination of a difficult task and high anxiety made performance drop. 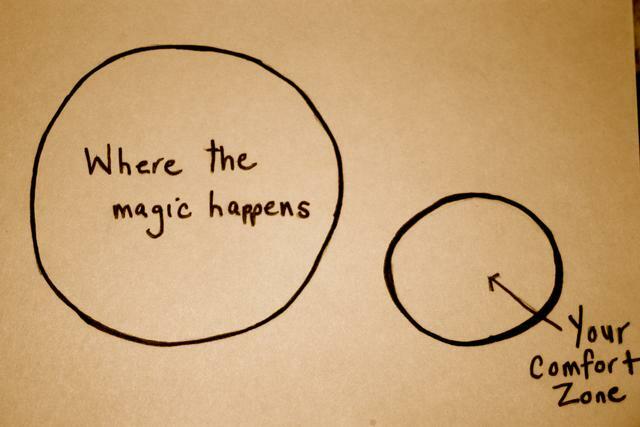 The comfort zone is often illustrated like the image above, where the comfort zone extends into a learning zone, but eventually leads to a panic zone, where anxiety is too high. We can use this illustration to understand the results of the mouse experiment. When the task was easy, the mice were in their comfort zones—they completed it without feeling much anxiety at all. As anxiety levels rose, the mice entered their learning zone and performed better. In the difficult task, however, it took less anxiety for them to hit their learning zone, and they soon hit their panic zone where performance dropped. A lot of the anxiety that comes from leaving your comfort zone is due to uncomfortable levels of uncertainty. There’s a reason that cooking dinner is no big deal when you do it all the time—it’s familiar, and you know what to expect. Driving a car for the first time or skydiving or starting a new job are all activities that are full of uncertainty, and thus, anxiety. Uncertainty can make us respond more strongly to negative experiences. A study found that when negative images were preceded by uncertainty, they were more upsetting than when participants expected them. We’re also more likely to respond negatively to new things, even though we may come to like them over time. Researcher, Brené Brown, says that uncertain social, political, or economic conditions can effectively make our comfort zones smaller. The more afraid we are, the smaller our comfort zone becomes and the more difficult it is to break out of it. Trying new things takes energy, so when we’re feeling tired or flat, we’re more likely to lean on old habits than take a new risk. So, should you break out of your comfort zone? Is it actually good for you? Science says yes, to some degree. Like the mice in the experiment I mentioned earlier, you want to find that sweet spot in the learning zone, and avoid going so far out of your comfort zone that you hit panic mode. When mixed with the feeling of success, some anxiety and self-doubt can lead to personal growth. This is why outdoor adventures like rock climbing or skydiving can be so exhilarating: they induce anxiety and unease but when completed, they give us a huge feeling of accomplishment and increase our base levels of confidence. Your comfort zone will growIf your comfort zone is small—i.e. the number of things you can do without feeling anxious are few—you’ll either be anxious a lot of the time or miss out on a lot of the excitement life has to offer. By getting out of your comfort zone more regularly, you’ll increase the number of things you’re comfortable with. You’ll also be able to enjoy more things in life, since familiarity makes us more likely to enjoy something, even if it turned us off at first. Doing new things motivates us and helps us learnNovelty tends to increase levels of dopamine in the brain, which is part of the brain’s ‘reward center’. Dopamine’s role centers around motivating us to go looking for rewards, and novelty increases that urge. Novelty has also been shown to improve memory and increase the possibilities for learning by making our brains more malleable. Finding that middle ground where you are anxious, but where those anxiety levels are still manageable, is what we are looking for. Once you become acclimated to that new level of anxiety, you have successfully expanded your comfort zone. If you want to push your comfort zone’s boundaries but you’re not sure where to start, there’s actually a tool online to measure your comfort zone. A short questionnaire about your comfort levels in professional, lifestyle and adrenaline-related events gives you a score and an idea about how big or small your comfort zone is. It also includes some reading and activity suggestions for increasing your comfort levels in each area. How far you want to push your boundaries is totally up to you, and will probably differ depending on what else is going on in your life. The trick seems to be maintaining a healthy balance between security and comfort, and a little novelty and excitement now and then.